Miss Directions: Would you wear real fur? However, I was given this jacket by the mother of a friend and I have been reasoning with myself. So my next question is, would you wear real fur if it was vintage? And second-hand from the 70s/80s? 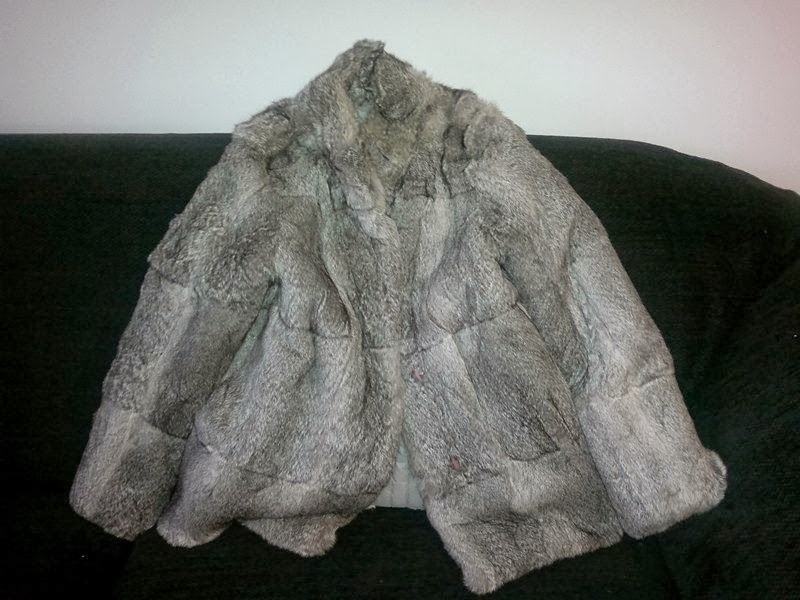 Does it make any difference that the jacket is rabbit fur and Australian made, and rabbits are 'feral' animals in Australia? I'm not sure I would wear it that often, but now I have it I couldn't part with it by dropping it in a charity bin or anything. I think it would be saved for rare occasions when a fancy night out or LBD would work with it. Would you throw red paint on me for wearing it? Would you even know it was real if you saw me?? Ahhh, I believe that it would be a waste not to wear it! The bunnies would have died in vain! I wouldn't go and buy some new fur... wouldn't want to be involved in consumer 'demand' or anything, but Vintage, I'd wear it... On special occasions, that is. Enjoy! I look forward to seeing how you wear it! It's a toughie and I would not want to buy nor wear a new fur piece, however, vintage does make sense to me. I wouldn't be able to tell if it's real or not, but just be prepared for people to yell things at you - it happened to me while wearing a faux fur jacket! I think you should wear it. It is vintage. You didn't go and actively source the jacket. On one hand, it's not like you've paid for it or fueled/funded the fur industry. And it already exists, and not using it would be a waste. On the other hand, it promotes the wearing of fur and who knows who might see it and lemming one of their own? Yeah I'm lost here too.. Not sure what I'd do if I were in your place. Let us know what you decide.. I was so anti fur as a youngster (But I was so judgemental back then and idealistic...ahh youth. A bunch of my friends snuck out at night and sledge hammered a concrete pipe that was to be part of an ocean outfall - sewage...I protested whaling and was briefly a vegetarian) but now, it doesn't really bother me. I mean we eat animals that if you do the research are hardly killed humanely and are raised purely to be slaughtered. We wear leather shoes. Face products & make up - tested on animals. Not to mention the fact that it has been uncovered that some fake fur is actually dog or cat fur. So I think the fact that fur gets such a bad rap is a little bit strange (now that I have grown up). Then add in the fact that rabbits are a huge pest here. I purchased a vintage fur stole recently and I absolutely adore it and it was literally on it's way to landfill. Which is such a huge issue again. The way my daughters go through clothes I am literally throwing out clothes every second day (with giant holes in them). At least purchasing second hand or vintage we are keeping things out of landfill. As for whether or not you get things thrown on you - I don't know. I haven't had an issue yet, but I have only worn mine out twice. I would definitely wear it. It's a beautiful piece. So even as a bunny rabbit lover, I'd say wear it - just don't go around announcing they killed 10 cute little fluffy bunny rabbits for it. This is a tough one. I face this kind of dilemma all the time - I am a vegetarian and as a rule don't wear leather, but there have been a few instances in which I have: I was gifted a pair of Supersoft flats, because my mum knew I had been looking for a good quality pair and didn't think to check if they were leather. I also have a bag that used to belong to her that is leather, and I use it all the time! Both make me cringe with guilt when I think about it too much though. Same with makeup/skincare. I try to buy brands that do not test on animals but I have not researched well and know I must own things by brands that do. These topics are troublesome. I have no issue with vintage fur. The means by which the fur was made happened a long time ago. You are in no way supporting the fur trade because you didn't pay for it back then, nor did you buy something that supports the industry today. Plus, you can kinda tell when something is vintage and people will just assume it is. I don't know of anyone in my world who would go out and buy a brand new fur-something, so I would always assume it's vintage. I had this conversation on the weekend. Personally I feel that it is ok if it has been passed on 2-3 times before it has got to me. But just because I am ok with it doesn't mean other people will be, so i'm not sure if I would actually wear it. Now I'm not a vegetarian but am interested in animal rights. I think we should give good lives to those animals that will eventually die for our benefit. I do wonder if the people that don't eat meat, don't wear leather and wear cruelty-free makeup, do they also not take any medical treatment? Since almost all our drugs are tested by animals before they become fit for human use. I would be outraged to learn that somebody was in possession of this coat and didn't wear it on grounds of protecting animal rights. I bet that the same people who are critical of wearing fur are the same people that wear synthetic leather jackets. The kinds made by fingerless children in factories in Bangladesh. 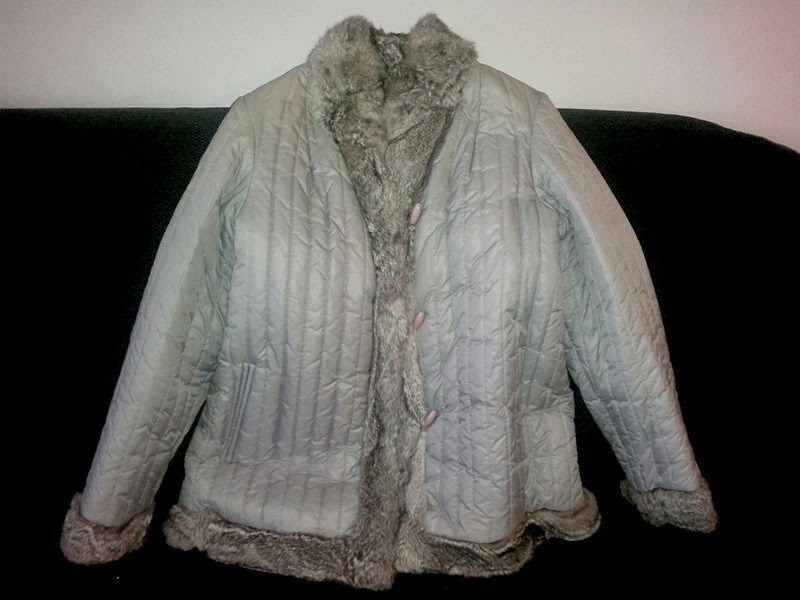 You can wear a stunning coat like the one pictured, knowing that a few rabbits died via a bullet, or you can were a ValleyGirl piece of trash knowing that the kids who made that are slowly dying in poor working conditions. What's better?